A transform boundary is a fault zone where two plates slide past each other horizontally. Most transform faults are found in the ocean where they offset spreading ridges creating a zigzag pattern between the plates. Some transform faults occur on land. The most famous transform fault is the San Andreas Fault which connects the East Pacific Rise and the Juan de Fuca Plate. Plates separated by a transform fault do not glide past each other. Friction in the rocks causes the plates to lock. The strain in the rocks slowly increases until they fracture. The sudden release of energy is what we feel during an earthquake. The breaking rocks allow the plates to slip past each other. 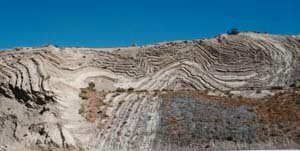 Transform faults are either right-lateral or left-lateral strike-slip faults. When you look across the fault to the other side if the streams and trees seem to have moved to the right then it is a right-lateral strike-slip fault. The San Andreas Fault is the transform boundary between the North American Plate and the Pacific Plate. During the 1906 San Francisco earthquake the northern section of the San Andreas Fault slipped northward along the fault from San Juan Bautista to Cape Mendocino, a total of 296 miles (477km). The central section of the San Andreas Fault had a series of large earthquakes in 1857 devastating the region. Now scientists are watching the southern section because strain in the rocks has been building up for over 300 years. In 2005 one scientists said that pressure continues to build in the southern section and the possibility large earthquake could be triggered at anytime. The fault boundaries on land are associated with frequent earthquakes. Small movement along the fault can trigger deadly earthquakes with large populations. Charles Richter in 1935 devised the Richter magnitude scale to measure earthquakes along the San Andreas Fault. Today, this scale is often used to describe earthquakes. Pacific Plate The Pacific Plate is the largest plate on Earth. Great earthquakes and towering volcanoes surround the plate along the Pacific Ring of Fire. Ocean Trenches Find out how plates diving beneath other crustal plates create trenches on the ocean floor that are deepest points on Earth. S Waves Find out about S waves and how they are produced and travel through the Earth. Plate Movements Moving plates on our planet converge, separate and slide past each other. Nazca Plate This plate converges with the Pacific Plate producing very large earthquakes off the coast of Chile. Transform Boundary These boundaries are found all around our ocean floors where oceanic plates are separating. Plate Tectonics Find out lots of fascinating facts and interesting trivia on plate tectonics.